Paying vendors and freelancers is a time consuming task, especially as your business grows with each new employee. Workspoke automates on-time payments for your entire team and let’s you focus on business growth. It makes life easier for you while providing your freelancers with consistency they can count on. to make payouts easier than ever. Managing freelancers and ensuring payments are made on time has become a full time job in itself. Payments have become commoditized, yet management of payments remains difficult and time consuming. Workspoke is an all-in-one freelancer management solution to help you automate payments so you can focus on business growth. 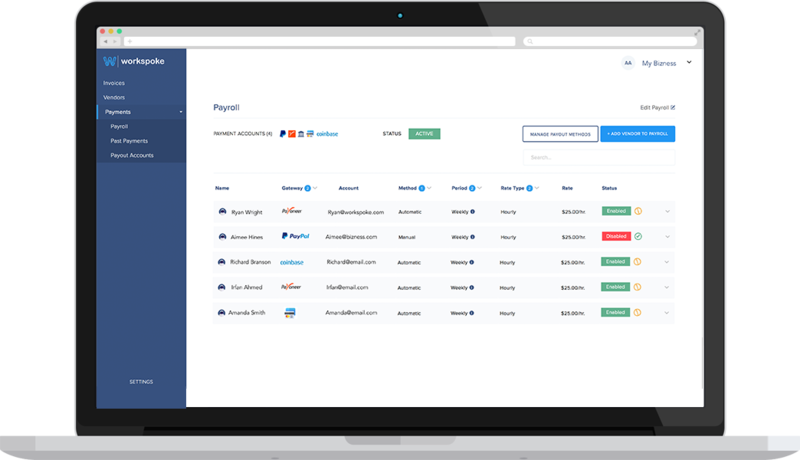 Create flexible automated payments system that helps you manage invoices from freelancers, manage vendor accounts and pay via Paypal, Stripe,Payoneer and more. Keep track of your past payment records with custom reporting and dashboards from Workspoke. Never lose track of what you have spent! All your freelancers and vendors get paid on time for the work completed, without you making manual transactions. Manage invoices from freelancers and vendors on the Workspoke dashboard. Never lose track of payout details. Workspoke works with PayPal, Payoneer, Stripe and more. Make payments easily, irrespective of where you’ve generated an invoice from. Keep your focus on business growth and automate payments management for your entire team with Workspoke. Create weekly, bi-weekly or custom payout cycles for your freelancers. Make payments faster and always on time. Easily manage invoices sent from freelancers. Identify what your team is working on and never lose track of your payment records. Manage all your vendor data on Workspoke efficiently. Automate their payments based, without bookkeeping! reports every time a payment is made. Generate past payment reports every time a payment is made. Keep track of who you’ve made payments to, the amount you were billed for and the date range of the time worked. Workspoke supports businesses of all types and makes managing freelancer payments easier for them. We’ve built Workspoke to simplify payouts and payment records management. We want you to focus on what matters the most - your business growth. path d="M494.933,38.4h-409.6c-9.412,0-17.067,7.654-17.067,17.067v17.067H51.2c-9.412,0-17.067,7.654-17.067,17.067v17.067 H17.067C7.654,106.667,0,114.321,0,123.733v332.8c0,9.412,7.654,17.067,17.067,17.067h409.6c9.412,0,17.067-7.654,17.067-17.067 v-17.067H460.8c9.412,0,17.067-7.654,17.067-17.067v-17.067h17.067c9.412,0,17.067-7.654,17.067-17.067v-332.8 C512,46.054,504.346,38.4,494.933,38.4z M17.067,123.733h409.6l0.009,190.635l-44.783-51.183c-3.251-3.721-9.6-3.721-12.851,0 l-54.067,61.79L167.799,194.159c-3.234-2.884-8.098-2.884-11.332,0L17.067,318.071V123.733z M426.684,431.01v25.523H17.067V340.89 l145.067-128.947l147.934,131.49c1.69,1.51,3.942,2.193,6.204,2.142c2.278-0.145,4.395-1.186,5.888-2.901l53.308-60.911 l51.209,58.53l0.008,90.573c0,0.017-0.017,0.043-0.017,0.068S426.684,430.985,426.684,431.01z M460.8,422.4h-17.067V123.733 c0-9.412-7.654-17.067-17.067-17.067H51.2V89.6h409.6V422.4z M494.933,388.267h-17.067V89.6c0-9.412-7.654-17.067-17.067-17.067 H85.333V55.467h409.6V388.267z"